My mom’s financial and health situation right now is dire. She’s at risk for losing her home and she’s already lost her career as the result of being struck by a negligent driver at an intersection back in mid-April. She sustained a severe concussion, and as a result, traumatic brain injury presenting as dementia. Currently, she’s performing below the second percentile in most memory- and speech-related tasks. The insurance company will eventually begin paying a small portion of her lost wages, but they are taking a ridiculously long time to pay her anything at all. It’s incredibly difficult for her (and also for me, as her part-time caretaker) and she’s begun to panic about losing her house. I’ve been funneling a fair amount of my money toward buying her food and paying for sundry other expenses for her, but it’s not sustainable for either of us. Price points may vary as I find I’m not charging enough (or am charging too much.) I haven’t done the exact math yet to work out how much materials cost (organic spices are pricey!) and I want to be fair to any customers and to myself. I’d love feedback on how much to charge per pint, per quart, et cetera. Thus far, the pickles seem to be a hit with a few co-workers and with Mike Neir. I’ll post a complete ingredient list once I get my recipes fully fleshed-out and written down. Delivery is available to those at work and probably to other places, too. Internet sales are prohibited by law, unfortunately; I have to sell directly to the consumer in person. These are all gluten-free and vegetarian, and though I need to look up Kosher specifications, I suspect the dills are indeed Kosher. 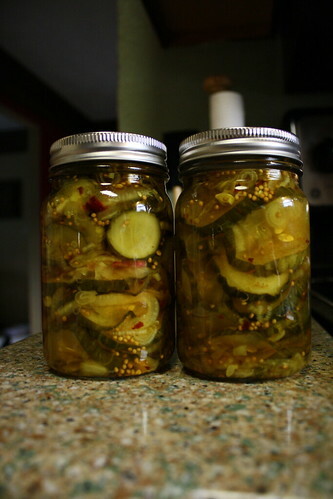 The fermented pickles are always fermented in glass, not plastic. Dills should be refrigerated immediately to prevent further fermentation, bread & butter varieties can be kept outside the fridge until opened, at which point keep in the fridge. Return the jar to me, and get seventy-five cents off the next purchase. Given my limited time and resources (and market,) I’m not expecting to make a ton of money from this, but every little bit counts! Without further ado, I present you with my “current product line-up,” and can also do special orders. A variation on Alton Brown’s dill pickle recipe, this is a classic dill pickle slice with a strong garlic flavor. Made with extra red pepper and fermented with inferno and Hungarian wax peppers, this recipe packs a delayed but attention-getting punch to the face. On a scale of one to ten, ten being hottest, I’d put these around a six. Elongated slices to better cover your sammich. Ingredients: Cucumbers, water, kosher salt, [one or more of the following: Inferno pepper, Hungarian wax pepper, Thai hot pepper,] dill weed, mustard seed, black peppercorns, allspice berries, red pepper flakes, garlic, horseradish leaves. Using a classic Sour Pickle recipe, these are much like the sour pickles one used to find in classic old-school delis, in your basic quarter-cuke spear shape. These will not fit into half-pint jars. Ingredients: Cucumbers, water, sea salt, garlic, dill weed, mustard seed, black peppercorns, horseradish leaves. The spears are back into product development – I am not satisfied with the outcome on the first batch at all, and gave them to the recipients for free. They’re far too salty and need to be soaked in fresh water to desalinate, and the taste was unremarkable. Not quite your grandma’s bread and butter pickle recipe – Inferno and Hungarian wax peppers counterbalance the sweetness of organic cane sugar and sweet onions in this twist on a classic bread & butter pickle. On a scale of one to ten, I’d put these around five, and I suspect I’ll be making relish out of this recipe in the future. It’s damned tasty. Ingredients: Cucumbers, sweet onion, water, kosher salt, sugar, garlic, [one or more of the following: Inferno pepper, Hungarian wax pepper, Thai hot pepper,] apple cider vinegar, turmeric, celery seed, mustard seed, black peppercorns, red pepper flakes. Simple, sweet and tangy – my own ever-evolving bread & butter recipe, using a metric plethora of organic spices, cane sugar and sweet onions. Ingredients: Cucumbers, sweet onion, water, kosher salt, sugar, garlic, apple cider vinegar, turmeric, celery seed, mustard seed, black peppercorns. The same recipe as the above bread & butter, but includes purple sweet peppers in the batch. I know sweet peppers can be a love ’em or hate ’em sort of thing, so I’m offering them with and without. Ingredients: Cucumbers, sweet onion, purple sweet pepper, water, kosher salt, sugar, garlic, apple cider vinegar, turmeric, celery seed, mustard seed, black peppercorns, red pepper flakes. That’s all I have at the moment, but there are certainly plans for expansion. Carrots, peppers, beans, tomatoes and more! As soon as it stops raining, I’ll be planting more cucumbers in the hopes of a late crop coming in to extend the season and will also be getting a succession crop of carrots in. The tomato plants are so laden they’ve almost all toppled over their stakes – lots of good stuff soon to be harvested! 2 responses to Pickles for Mom, Pickles for You! Honey, I’ll be happy to not only buy a bunch of pickles, but to come and pick them up in person! I’m completely serious! Let’s talk soon!